LOCAL SITES AND HISTORY OF "THE ROLLING HILLS"
You are invited to tour our Manvers community while on our Rolling Hills Studio Tour, which includes the villages of Pontypool and Bethany! Visit many of the artists that make their home on the environmentally sensitive area of the Oak Ridges Moraine, known as the Jewel in the Crown. You have not been to the country until you have traveled our country roads of Manvers Township, known officially as the City of Kawartha Lakes. Imagine the days of Yester-Year when life was simpler, and these rolling hills were the peaks and valleys of ones life. This area is one of Ontarios best kept secret! Pontypool first settlers arrived in the mid 1800s named the village after their home in Pontypool, Wales. It became a hub of activities of the area farmers and business. In the 1920-50s Pontypool was known as a summer resort for hundreds of from the Jewish community in Toronto. Doctors prescribed stays at the resort as the climate and conditions seemed to alleviate rheumatism and asthmatic conditions. It also has been said that the waters seem to have a special healing effect. Many a Jewish family took the train to Pontypool for the weekends. Fathers often brought their families to stay the week to latter join them the following weekends. Cottages sprang up around the Big Pond. About 5 acres of spring water was the playground for these families who also enjoyed dances, playing cards and summer weekend entertainment. Today this pond has all but dried-up the, resort community has disappeared and the Jewish Synagogue built for this seasonal community no longer stands. However, great memories still remain! In 2005, a reunion of over 700 came back to Pontypool who enjoyed this unique Jewish Resort. Many a childhood summer memories were born and nurtured here. Bring your camera for a picture of our historical Grain Elevator and its unique construction! 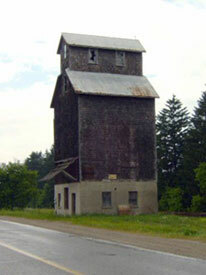 Canadian Pacific Railway, has given the elevator to the "Friends of the Pontypool Elevator" heritage group. They are hoping to have the structure declared a historic site. As throughout history, towns and villages sprang up around the railway system. In the mid 1800s the wood burning Iron Horse as it was once known, traveling at 60 miles an hour, became the centre point of Bethany Village. The Oak Ridges Moraine Oak Ridges Moraine conjures up images of rolling hills, scenic vistas and spectacular fall foliage, stretching 160 Kilometers from the Niagara Escapement east thought the Greater Toronto Area to the Rice Lake Plains. 30% is forest covered and are a key natural landscape in southern Ontario. It is described as the most southern Rain barrel. Drive the rolling hills and envision the Great Wisconson Glacier of 10 million years ago that etched it way as it's advanced and retreated through this land pushing rock and gravel to provide for us today a filter of our very own drinking water. One of the moraine's most important functions is as a water recharge/discharge area - sustaining the health of the many watersheds, which originate in the moraine and directly providing drinking water to over 250,000 people. Its permeable sands and gravels absorb and collect precipitation, which slowly recharge the deep aquifers below the ground. Over five million people live on or near it, rely on this drinking water. The forests, savannahs, prairies, wetlands, lakes and streams of the Oak Ridges Moraine provide habitat for many plant and animal species, of which 77 are imperiled provincially or nationally, including rarities such as West Virginia White Butterfly, Jefferson Salamander, Red-shouldered Hawk and American Ginseng. A concentration of provincially rare wetlands within the Oak Ridges Moraine support plants and insects more typical of northern Ontario and the remnant tall grass prairie and oak-pine savannah occurring in the eastern portion are recognized as globally threatened ecosystems. The original township of Cavan and Millbrook was surveyed by John Deyell in 1817, and was named after County Cavan in Ireland, from which many of its settlers had emigrated. By 1819 there were 244 settlers, and by 1861 the population had risen to 4901, many of whom were descendants of United Empire Loyalists, veterans of the War of 1812 who had been granted land there, or the original and later settlers from Ireland. After Confederation in 1867, the population began to drop as many families left for Western Canada. The original Irish settlers were Protestants, and many of them were associated with the Orange Order. In the mid-19th century the "Cavan Blazers" were established as a fiercely Protestant vigilante group, who often burned down the farms of Catholic settlers.